Did Sears Kit Homes Come in Brick? In this post I will debunk another myth about Sears homes. "My house is brick so it cannot be from a catalog." "I've seen many Sears kit houses over the years and it seems to me they were all of frame construction." Sears Roebuck did offer their houses in brick. These were not solid brick homes, but brick veneer homes (Sears often used the term "face brick"). Let's get our terms straight. There are two kinds of brick: common brick and face brick. Common brick is the less expensive of the two. It is not selected for color or texture, and the dimensions may not be consistent. Face brick is more attractive, with its facade more finished and smoothed. 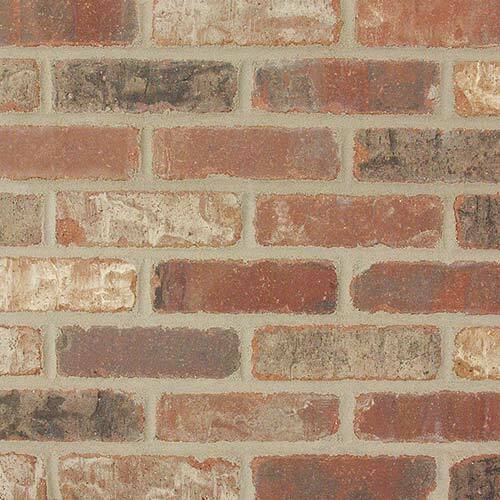 The color of face brick is uniform. Sears would furnish face brick to its customers, but not common brick (like that often used to build the foundations). A solid brick house means that the brick walls hold the house up and are load bearing. The walls are solid brick and two layers deep. Brick veneer (or brick-on-frame construction) means that the brick you see on the outside of the house is only one brick thick and it is anchored to the wood frame wall beneath. The house is of frame construction. The wood frame holds the house up, not the brick veneer. The veneer is for appearance only and not structural support. One quick way to tell if a house is solid brick or brick veneer is by looking for header rows. In most solid brick houses, every six rows or so there will be a row where you can see the end of the bricks (the header row). Brick veneer houses typically do not have functional header rows (sometimes they are decorative) and you will only see the sides of the bricks. The header row on a solid brick house. Brick veneer. All bricks are laid the same. 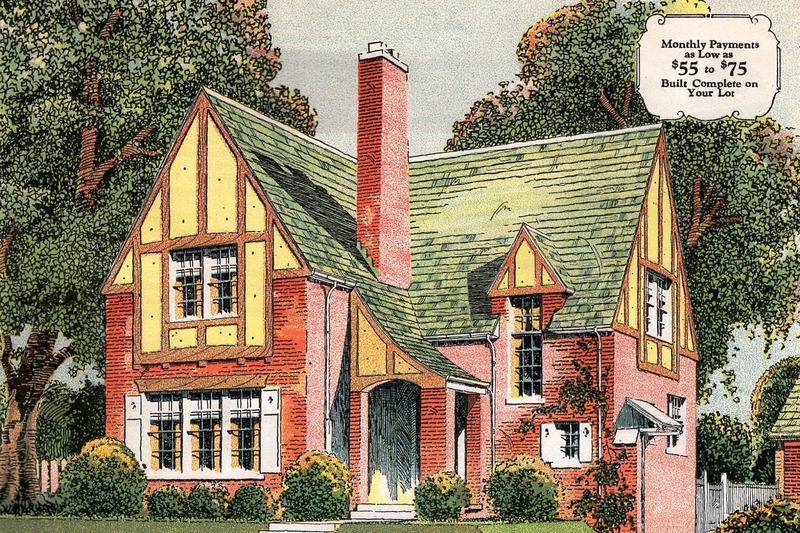 Sears really started pushing the sale of brick veneer homes in 1929. They even issued a special catalog supplement. The 1929 catalog supplement with a brick Mitchell on the cover. Downers Grove has a nice example of a Sears Elmhurst model in brick veneer. 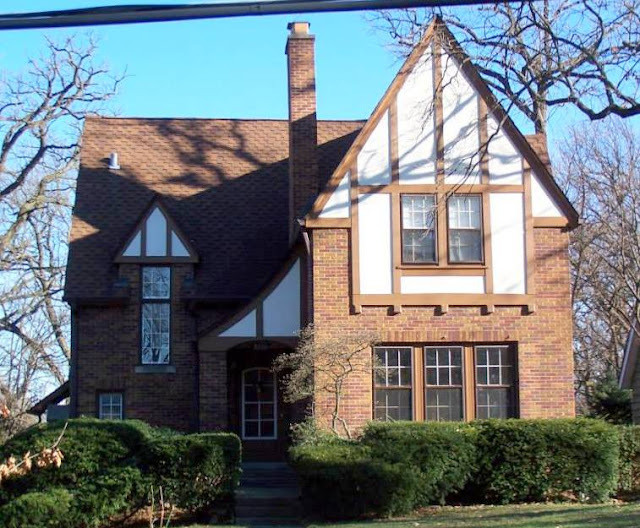 5535 Dunham Road, Downers Grove. 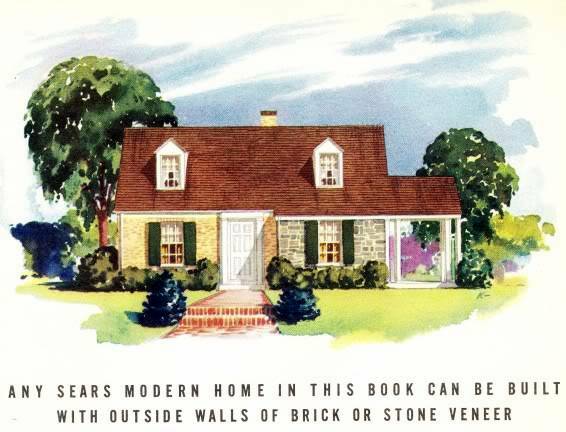 Sears Elmhurst, from the Brick Veneer Honor Bilt Homes catalog. This Elmhurst was built in 1930. It is an authentic Sears house--the owner found a shipping label. A closeup of the brick veneer on the Elmhurst. Photo courtesy of Sue Smith. The original owners were William A. Nielsen and his wife, Helen. William was an engineer for a telephone equipment manufacturer. They took out a mortgage from Sears for $10,700 in 1930 to build the house. 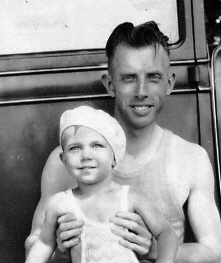 William Nielsen with daughter Nancy. [Owner Amy] Bailicki cherishes the nooks and quirks of her living room. "The walls are plaster and not just flat," she said. "It's almost like someone took a soup can and smeared it into the plaster and made little swirly circles. There are two symmetrical archways in the living room and we have all the original woodwork." That "header row" information is very interesting. The next time I'm driving in the city here, where most all of the houses are solid brick, I'm going to take a closer look.